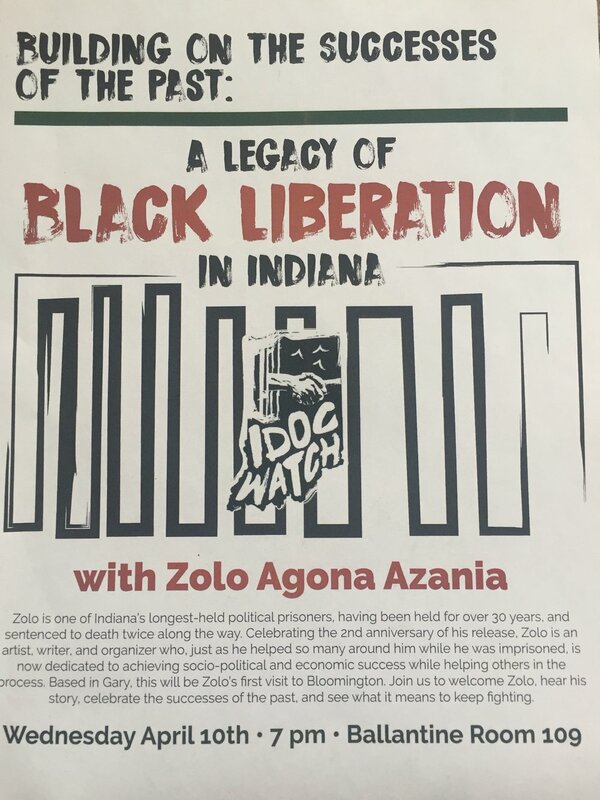 Zolo is one of Indiana’s longest-held political prisoners, having been held for over 30 years, and sentenced to death twice along the way. Celebrating the 2nd anniversary of his release, Zolo is an artist, writer, and organizer who, just as he helped so many around him while he was imprisoned, is now dedicated to achieving socio-political and economic success while helping others in the process. Based in Gary, this will be Zolo’s first visit to Bloomington. Join us on April 10th at 7 pm to welcome Zolo, hear his story, celebrate the successes of the past, and see what it means to keep fighting. This event will be held in Ballantine Hall on the Indiana University Bloomington campus. Closest reliable parking is a garage on 6th street, it will be free after 5 pm.